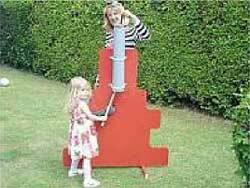 Giant games are great fun for all the family, so it’s not surprising that people often hire giant games for weddings and garden parties. Thankfully, as most of the games can be played indoors as well as outdoors, you don’t even have to rely on the British weather. 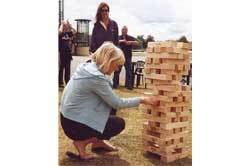 Giant games are not only great fun, but they’re great at helping people bond too, which is why they’re popular for corporate events and team building days too. If you’re looking to hire giant games, take a look down the list for inspiration. If there’s a particular game you’re after that isn’t listed, please let us know and we will try to source it for you. 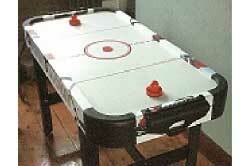 Air Hockey is a two player game. The object of the game is to be the first player to score a pre-determined number of points or to score the most points in a given amount of time. Mains supply required. Area required 4′ x 4′. 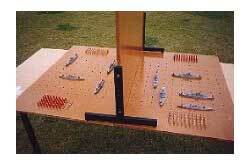 Unsurprisingly based on the ever popular Battleships, this giant version provides fun for all age groups. Arrange your ships on your side of the board and try to find your opponents ships before they find yours. Compete against friends, family or colleagues at a game of boules. The aim of the game is to roll your boules closest to the jack. Play in teams or against other individuals. 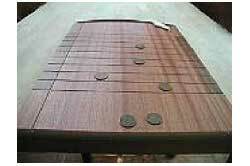 The Buzz Bar or Steady Hand Game is a two player game which requires skill and patience to manoeuvre round the intricate circuit. Ideal as a team builder or simply just for fun. Based on the popular marble drop game, contestants must remove straws one at a time without the cannonball dropping. A great game for all ages. 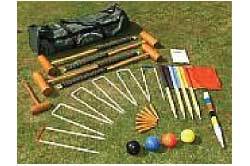 Croquet is a game of tactics. The key to success is to progress your own ball(s) through the hoops, whilst at the same time, causing your opponent(s) as much inconvenience as possible. One team takes black and blue, the other red and yellow. A team can be one or two players. Ideal area required 35 by 28 yards. 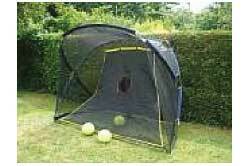 Ideal for fun days, either shoot at the target or alternatively beat the goalie, yours or ours! Supplied with 3 footballs. Area required 8′ x12′ x 7′. 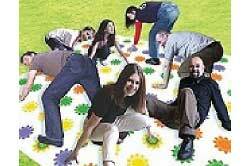 The object of the game is to be the last player left standing as you obey the large inflatable dice and place your hands and feet on the coloured circles on the mat. The game is suitable for all ages. Area required 10′ x 10′. 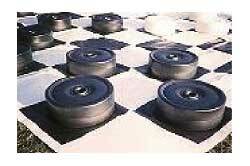 This giant version of draughts tests the strategic minds of two players as they try to capture each other’s pieces by jumping over them. Area required 10′ x 10′. This giant version of snakes and ladders puts you right in the heart of the game, where you act as the counter moving up the ladders and down the snakes. Area required 10′ x 10′. Put yours and your friends putting skills to the test with the golf putting challenge. 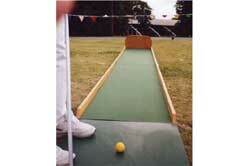 The golf putting challenge is suitable for all ages and abilities. Area required 14′ x 2′. A game of skill and cunning. 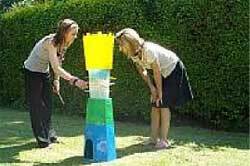 Build the tower, then take it in turns to remove a piece and add it to the top without making the whole tower tumble. 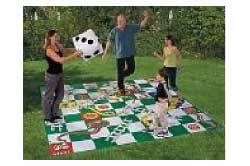 Play head to head or in two teams for bigger scale party fun. 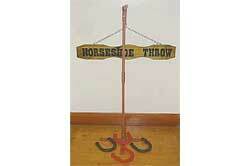 Traditional horseshoe game consisting of a pin and 4 lightweight plastic horseshoes suitable for indoor use. 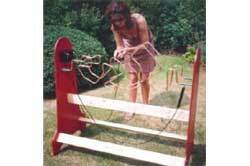 An outside version is also available using metal horseshoes. Based on the popular Connect 4 game, this two player game provides fun for the contestants and fascination for the audience. This popular ring throwing game is always a favourite. Compete to see how many rings you can throw over one or many spikes. The person with the most rings landing over the spike(s) wins. Each player has five coins per turn and for every coin that ends in a bed, a chalk mark is made in the appropriate scoring square. The game is won by the player who gets a three coins score in each of the nine beds. If you get more than three in a bed, the extra points are given to your opponent, if he needs them. The only exception to this is the final winning point, which must be scored and not received to win. 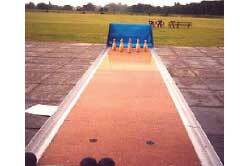 The 9-pin skittle alley is a traditional game suitable for players of all ages and abilities. Games can be organised on a team or individual basis. Area required 26′ x 8′. Can you splat the rat? Watch the rat as he’s released down the drainpipe and strike it before it hits the floor. Great fun for all ages. 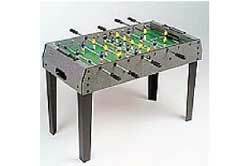 Table football can be played by two teams of two players each or by two individuals. The object of the game is to be the first team or player to score a predetermined number of points or to score the most points in a given amount of time. Area required 4′ x 4′. If you’d like to hire giant games from us, or talk to us about any of our other outdoor entertainment, simply give us a call or send us an email. Quotes are available on request. Copyright ©2015 by Dings Ltd. All Rights Reserved. Website by Compunet Systems Ltd.